1. 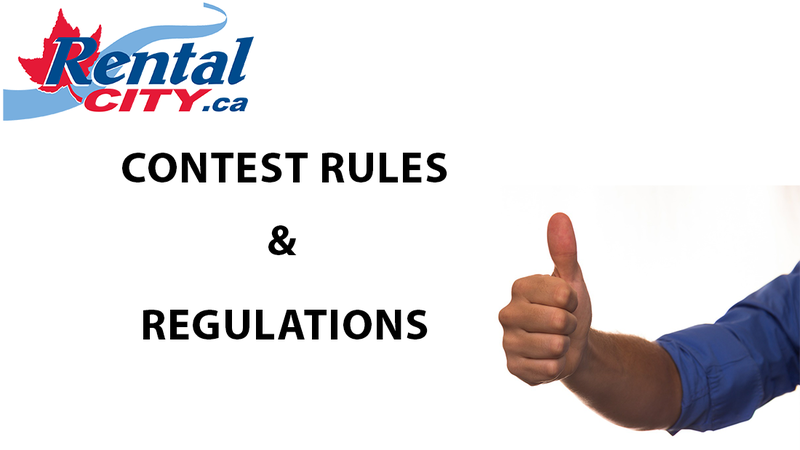 Rental City runs live Contests throughout the year on it’s website, newsletters, social media pages and in stores in Ontario, Canada For these Contests, the Contest Period, duration and timing will be identified on the website (www.rentalcity.ca) or in writing or in stores. Online contests (hereinafter: the “Contest”) is brought to you by Rental City, (hereinafter: the “Contest Organizers”). The Contest runs in Ontario, Canada. 2. This Contest is open to all persons residing in Ontario, Canada who have reached the age of majority in their province or territory of residence as of the first day of the Contest Period. Notwithstanding the preceding, the Contest is not open to individuals associated with the Contest, including the employees, agents and representatives of the Contest Organizers, (including their respective divisions, subsidiaries, affiliates and agencies), their advertising and promotional agencies, suppliers of prizes, materials and services related to this contest or any other party directly linked to the holding of this Contest (the “Excluded Individuals”). This Contest is also not open to the immediate family members of the Excluded Individuals. For the purpose of these Contest Rules, “immediate family” includes: father, mother, brothers, sisters, children, legal or common-law spouse and individuals with whom such employees, agents and representatives reside. 3. No purchase necessary. To enter, you must comply with the eligibility criteria set out in these Contest Rules, during the Contest Period. You may be required to join our Newsletter mailing list or otherwise supply information via a web form or ballot in stores to be eligible to enter. Complete the electronic or physical entry form (hereinafter: the “Entry Form”) by filling out all mandatory fields, including: your last name, first name, age, complete address and postal code, phone number and area code, email address, (correct answer to the mathematical skill-testing question on the waver form). Follow the instructions to confirm your eligibility and confirm that you have read and agreed to comply with the Contest Rules. Then send your Entry Form no later than contest date. 4.2 The use of only one email address per person is allowed, if a person has more than one. 5. PRIZES: There are various prizes available to be won which will be identified on the contest page or in store information host at the time of the Contest. The prize may include one of the following: restaurant gift certificates, gift certificates for certain retail stores , gift baskets, rental value in our stores, or good or services. Only one prize per household. The approximate retail value of a prize can vary and is available upon request at the time of the particular contest. If you are a declared winner, you must pick up your prize up at the Rental City store that administered the Contest. In some cases, we may be able to provide pick up at another of our stores. Potential winners will be required to furnish proof of identification such as a driver’s license or social security numbers. 6. All expenses other than those specifically mentioned above as included shall be assumed by the winner. 7. There is a limit of one prize per person AND per household. In addition, a contestant will not be eligible to win more than one prize during a period of thirty (30) days in any contest held by Rental City and any contest held on the website of www.rentalcity.ca. Any potential winner selected in this Contest who does not comply with this condition will automatically be disqualified and another draw will take place to designate a winner. An ID may be required when claiming the prize. 8. At the office of the Contest organizers, a random draw of one entry [OR multiple entries pending on the number of prizes outlined in the specific contest] will be held among all entries received in accordance with section 3, in order to award the prize(s), described above. 9. There is a limit of one prize, grand prize or secondary prize per person per household per contest. In addition, a contestant will not be eligible to win more than one prize during a period of thirty (30) days in any contest held by Rental City and any contest held on the website of www.rentalcity.ca. Any potential winner selected in this Contest who does not comply with this condition will automatically be disqualified and another draw will take place to designate a winner. An ID may be required when claiming the prize. 10. The odds of a participant’s entry being randomly selected depend upon the number of entries received in accordance with section 3 above. 11.3 If required, sign a publicity release and liability waiver form (hereinafter: the “Release Form”) sent by the Contest Organizers and return it to them within fifteen 15) days [or less only if circumstances are justified] of receipt. 12. By entering the Contest, each entrant agrees to abide by these Contest Rules. In the event the potential or declared winner fails to comply with any one of the conditions set out above or any other conditions set out in these Contest Rules, the Contest Organizers reserve the right to disqualify such entrant from the Contest and if time allows, a new draw for the prize will be held in accordance with these Contest Rules, until an entrant is selected and declared a winner, without affecting the order in which other prizes are awarded. In order for a potential winner who is a minor in his/her province of residence to be declared a winner, the minor’s parent or legal guardian must answer the skill-testing question, co-sign the standard form declaration and release prepared by the Contest Organizers and accept the prize on the minor’s behalf. 13. Within fifteen (15) days [or other period of time justified with each contest] following the moment the contestant is declared a winner the Contest Organizers will inform all winners on how to take possession of their prize OR winners will have to take possession of their prize by presenting themselves at the Peterborough Rental City store location, 1135 Lansdowne St. W, Unit #25, Peterborough, Ontario. In the event the winner fails to collect his or her prize in accordance with the instructions set out in this paragraph, the winner will forfeit the right to collect the prize, and the Contest Organizers reserve the right to withdraw the prize entirely, with no further obligation to award such prize in any additional draws. 14. Verification. Entry Forms are subject to verification by the Contest Organizers. Any Entry Form which is incomplete, incomprehensible, inaudible, illegible, fraudulent, mutilated, altered, contains false information or is not received within the Contest Period, or any Entry Form which does not contain the correct answer to the mathematical skill-testing question AND does not have the information that must be identified per contest or otherwise does not confirm to these Contest Rules will automatically be rendered invalid and will not entitle such entrant to be eligible for a prize. 15. Disqualification. The Contest Organizers reserve the right to disqualify any person or cancel one or more entries of any person participating in this Contest or trying to participate by means contrary to these Contest Rules or in a manner which is unfair to other entrants (e.g. : use of an Entry Form obtained from an unauthorized source, entries exceeding the limit allowed, computer hacking, etc.). Any attempt to tamper with the entry process, interfere with these Contest Rules, deliberately damage any website or undermine the administration, security or legitimate operation of the Contest, is a violation of criminal and civil laws and the Contest Organizers reserve the right to seek damages and/or other relief from all persons responsible for such acts to the fullest extent permitted by law, which may include banning or disqualifying entrants from this and future contests. Such person may be referred to the appropriate judicial authorities. 16. Non compliance/eligibility. If a potential or declared winner is not in compliance with these Contest Rules, the Contest Organizers reserve the right to disqualify such entrant from the Contest and randomly select further entrants from the remaining eligible entries until a winner is finally declared. Any potential or declared winner who is not in compliance with these Contest Rules, must so inform the Contest Organizers immediately upon being contacted by the Contest Organizers. 17. Acceptance of prize. Prizes must be accepted as described in these Contest Rules and may not be transferred to another person, substituted for another prize, or exchanged in full or in part for cash, subject to the section below. 18. Substitution of prize. In the event it is impossible, difficult and/or more costly for the Contest Organizers to award a prize (or part of a prize) as described in these Contest Rules, the Contest Organizers reserve the right to award a prize (or part of a prize) of similar nature and equivalent value or, at their sole discretion, the value of the prize (or of the part of the prize) in cash. 19. Refusal of a prize. The refusal by a potential or declared winner to accept any prize awarded in accordance with the Contest Rules, releases and forever discharges the Contest Organizers and their agents of all obligations related to the prize, including delivery. 20. Liability limit – use of prize. Each entrant and any potential or declared winner releases the Contest Organizers, their subsidiaries, respective divisions, their parent corporations, their advertising and promotional agencies, their shareholders, officers, directors, employees, agents and representatives (hereinafter: the “Beneficiaries”) from any and all liability for any and all damage, loss or liability suffered as a result of or arising from the entrant’s participation in the Contest or the acceptance or use of his/her prize. In order to be declared a winner and prior to obtaining his/her prize, any potential or declared winner agrees to sign a declaration to such effect in the Release Form. 21. Warranty. Any person selected for a prize [secondary or grand prize] acknowledges that the only warranty applicable to the prize is the standard manufacturer warranty. 22. Liability of prize supplier. Any person selected for a grand prize [OR a secondary prize] acknowledges that upon receipt of a letter confirming the prize, all services to be rendered in connection with their prize become the sole responsibility of the prize. 23. Liability limit – running of the contest. The Beneficiaries are not liable for faulty computer components, software, or links; the loss or non-existence of communications capability; or faulty, incomplete, incomprehensible, or erased computer or network transmissions that make it difficult, or render a user unable, to enter the contest; problems with any website or website feature howsoever caused, the malfunction of, or damage caused to, any telephone or network or lines, computer equipment, data or software, online systems, servers or access providers; or the security or privacy of information transmitted via computer networks; or for breaches of privacy due to interference by third party computer “hackers” The Beneficiaries are not liable for any harm contestants may suffer directly or indirectly as a result of downloading any Web page or software or transmitting any information related to entry in the Contest. Further, the Beneficiaries assume no responsibility for entries lost, stolen, delayed, damaged or misdirected. 24. Web site access. The Beneficiaries do not guarantee access to or non-interruption of the Web site during the Contest Period or that it will be exempt from any errors. 25. Modification. The Contest Organizers reserve the right, at their sole discretion, to cancel, terminate, modify or suspend this contest, in whole or in part, in the case of the occurrence of an event, an error or any human intervention that could corrupt or affect the administration, safety, impartiality or the running of the Contest as provided in these Contest Rules. 26. Early termination of the Contest. In the event that the computer system cannot record all the Contest entries during the Contest Period for whatever reason, or if participation in the Contest must be terminated in whole or in part before the closing date of the Contest as per the Contest Rules, the Contest Organizers will proceed with the draw among entry forms duly registered during the Contest Period or, as the case may be, up to the date of the event that lead to the termination of the Contest. 27. Limit of prizes. In no event shall the Beneficiaries be obligated to award more prizes than set out in these Contest Rules or to award prizes otherwise than in compliance with these Contest Rules. 28. Impossibility to act – labour dispute. The Beneficiaries shall not be responsible for any damages for a failure to operate the Contest in accordance with these Contest Rules in any case where their incapacity to act results from circumstances or a situation beyond their reasonable control or because of a strike, lock-out or any other labour dispute in their company or those of businesses which services are used for holding this Contest, war, riot, insurrection, earthquake, terrorism, civil commotion, fire, flood, accident, storm or any other act of nature. 29. Liability limit– participation. Any person who participates or tries to participate in this Contest releases the Beneficiaries from any and all liability for damages which he/she could suffer from participating or trying to participate in this Contest. 30. Authorization. By entering this Contest, each declared winner [or if a declared winner is a minor, the declared winner and his/her parent or legal guardian on his/her behalf] consents to the Contest Organizers, and their representatives to use, at their sole discretion and if required, their name, photograph, likeness, testimonial related to the prize, place of residence and/or voice without compensation whatsoever and that, without limit as for the period of use, in any media and on a worldwide scale, for publicity purposes or for any purpose that may be considered relevant. A declaration to such effect will be included in the Release Form. 31. List of winners. The name of the winner(s) will be available at the Peterborough Rental City store location, 1135 Lansdowne St. W, Unit #25, Peterborough, Ontario during normal business hours (excluding holidays) from Monday to Friday from 9:30 a.m. to 6 p.m.
32. Property of entries. Entry Forms [and requests for no purchase entry] are the sole property of the Contest Organizers and at no time will be returned to entrants. 33. Communication with entrants. No communication (other than while registering) or correspondence will be exchanged with entrants in the context of this Contest with the exception of selected entrants or declared winner. 34. Personal information. Contestant personal information that is collected in this Contest will be used solely by the Contest Organizers, and their representatives for the administration of the Contestm unless otherwise stated. There will be no communication of commercial or of any other nature, unrelated to this Contest sent to an entrant, unless such entrant gives specific authorization to the Contest Organizers for that specific purpose. Some contests may encourage signing up to our newsletter. Subscribers may unsubscribe at any time. There is no fee to sign up, receive or unsubscribe from our newsletter. 35. Decisions of the Contest Organizers. All decisions of the Contest Organizers or those of their representatives regarding this Contest are final and binding. 36. Identification of the contestant. For the purposes of these Contest Rules, the entrant is the person whose personal information is printed on the Entry Form. It is to this person that the mathematical skill-testing question will be asked and the prize awarded if selected and declared a winner. 37. Unenforceability. If a section of these Contest Rules is declared or ruled by a Court of Law as illegal, unenforceable or void, that section will be deemed void but all other sections not affected will be enforced as allowed by Law. 38. Jurisdiction. This Contest is subject to all applicable federal, provincial and municipal laws.